Green bean casserole is a traditional American Thanksgiving dish which seems to appear out of nowhere during the fall and winter holidays. Year-round, you'd be hard pressed to find it anywhere, but around Thanksgiving, the winter holidays and Christmas time, it's suddenly everywhere. 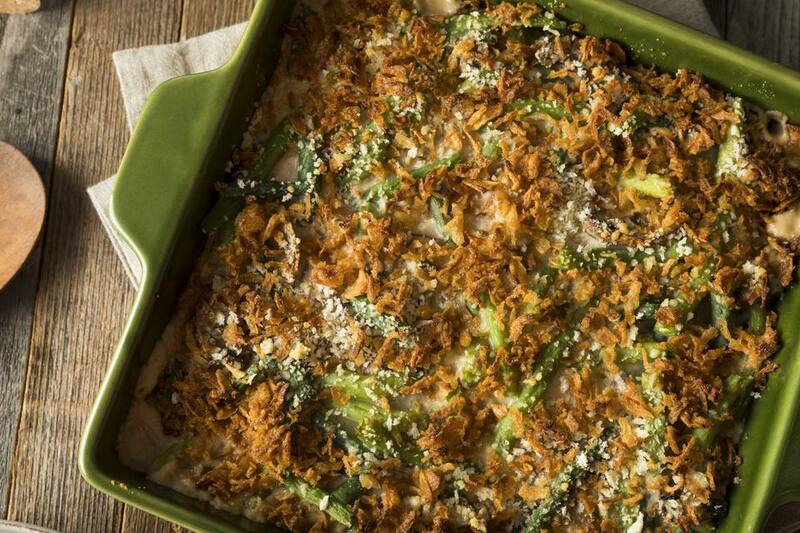 No Thanksgiving or Christmas table would be complete without a classic green bean casserole! This recipe is for a vegetarian and completely dairy-free and vegan version of a traditional green bean casserole, using vegan margarine and nutritional yeast in place of milk, cream, or the usual canned mushroom soup (ew!) to create a creamy and saucy vegan green bean casserole which is completely dairy-free and suitable for anyone on a vegan diet, and, of course, it's also much lighter as far as fat and calories. So, if you're looking for a lighter and healthier green bean casserole for any reason, this vegan green bean casserole recipe will be a good one for you to try - and it's still creamy and delicious. Swap out the soy sauce for tamari or gluten-free nama shoyu, and be sure that the vegetable broth you are using is gluten-free as well (some are and some aren't). And finally, you'll need to make sure you use a gluten-free flour in place of regular white flour, or, try using cornstarch as a thickener.